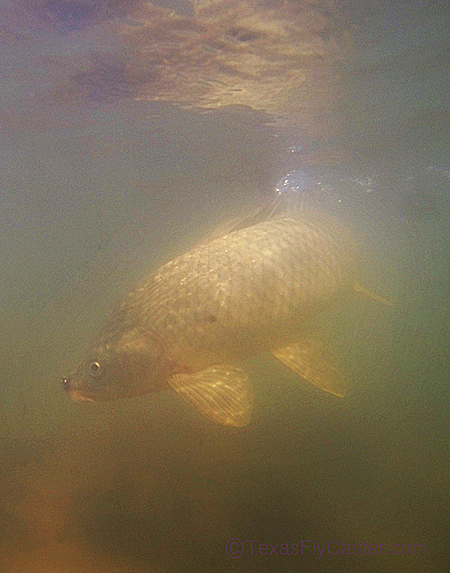 Imagine trying to shoot underwater photos and catch a carp at the same time! We’re looking at the 80’s today for a high, and the fish are jumping. If you’ve been thinking, “what’s this twitter thing,” or “what’s this facebook thing,” now is your time to take your fly fishing social life to the next level. For instance fly fishing guides, businesses and fly fishers can all interchange information on their addiction in a short amount of words via twitter (@texasflycaster) talkers that you follow. Just like a bird’s sound is called a “tweet,” so are those little messages, and when I send those little messages out this time of year they often start with all caps “FISH FLASH.” That headline is followed by the latest information from me or others I trust – about where the fish are biting at that time. All you need is an e mail address to create a twitter account, and you don’t even ever have to say anything if that’s too big a responsibility. Just click through and “Follow” the other accounts you want to hear from, yes, like Texas Fly Caster. Follow FISH FLASH tweets by finding @texasflycaster and clicking on “follow.” If you have questions about facebook, feel free to ask. I try to stay active with facebook, but the truth is it’s a pretty sorry interface and I should know. I’ve been a member of facebook since it was run by a ragtag band of students (now billionaires) who approved each and every person after an extensive application. For the many of you who were trying to book trips to fly fish for carp in the winter – I know I put you off, that is until the fish were actually around. I told you I would let you know when to pull the trigger on scheduling a half or full day of guided fly fishing for carp, and NOW IS THAT TIME. Photography work is finally relenting a bit, and the carp (and a few voracious spawned out sow bass) are coming in closer to shore doing their mating dances. It’s a fun thing to watch. The bite is always a little tougher when they are thinking about things other than eating, but I did okay yesterday, landing about five carp and one five pound largemouth that wandered into the flats looking for a meal. That crazy bass took a tiny Coyote Carp Fly that I dangled over its head, must have been just right I guess. Stay tuned because there’s more to come today and throughout this week. May is headed right off the charts. Thanks for reading from wherever you are this beautiful morning, and I look forward to hearing from you all in the coming days. Have a great day walking in on the Monday Morning Sidewalk.